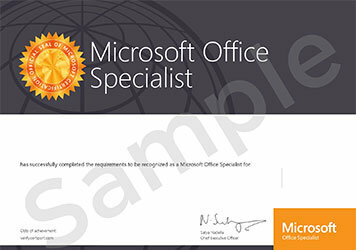 MOS (Microsoft Office Specialist) is the official certification implemented by Microsoft to validate your skills in using the full features and functionality of Microsoft Office. Welkin provides authorized MOS certification services in Hong Kong and Macao. We deliver exams for MOS 2010 and MOS 2013 certifications as well. Please go to Certiport official website (MOS 2013, MOS 2010) for exam objectives. Make sure that you understand the exam topics, the exam objectives and the exam mode clearly before taking an exam. The Microsoft Office Specialist exams are primarily performance-based and conducted in a “live,” or simulated, environment. MOS 2013 and MOS 2016 present the candidate with a project to build, with tasks and steps that build on each other. You are certified for the exam subject once you pass your exam. Your MOS certificate is available for download at the Certiport test candidate portal. You may include your name in the Microsoft Office Specialists listing and claim your digital badge to share your credential with others on social media sites such as LinkedIn and Facebook.